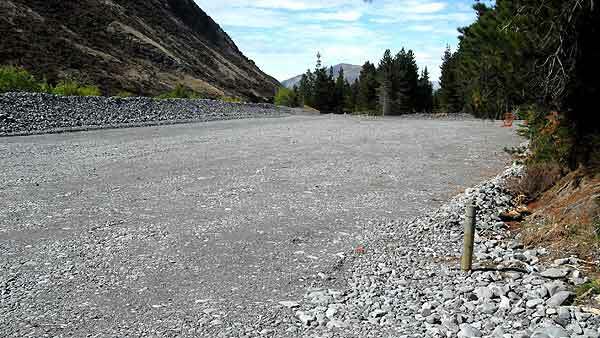 Many anglers will be unaware that a new camping ground has been created at the head of Lake Coleridge. Here it is. The new TrustPower Freedom Camping Area viewed from the road. There has obviously been quite a bit of money spent on leveling the ground, piling up the banks, installing water, and building the fence. 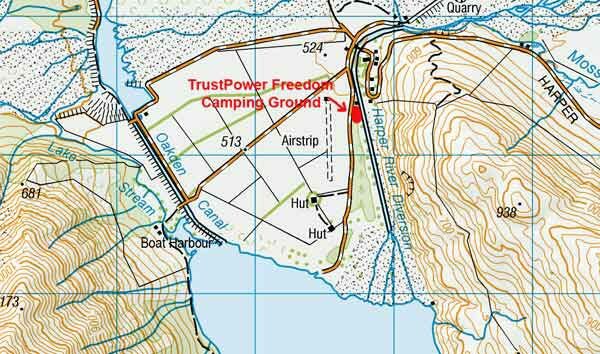 Updated February 2016 Lake Coleridge, Harper River, Freedom Camp Area – Trustpower. The camp ground has been constructed by Trustpower, on Trustpower land for the free use and benefit of the general public. Trustpower work together with Selwyn District Council parks officers in the management of the area. Please follow the ‘Pack it in, Pack it out’ method by removing all waste and leave nothing behind. The area is surrounded by working stations. 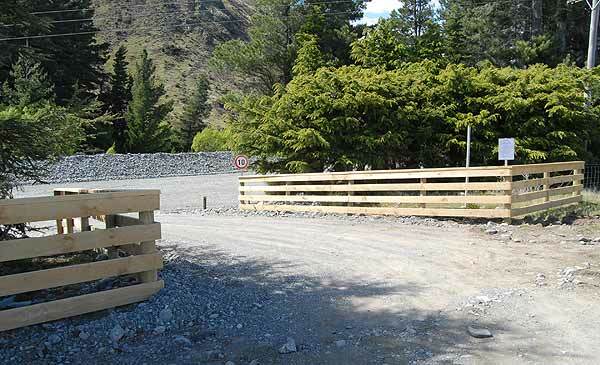 The access track to the Oakden boat launching spot goes through private farm land, so please respect the farmers, always leave gates as you found them and please do not bring dogs. Caravans are welcome, however there are no facilities to dump waste or connect to electricity. Access to the camp ground takes around 45 minutes by car from the Coleridge Power Station on an unsealed road, please bear this in mind if towing a boat or caravan. Weather conditions can change rapidly, in particular the area is prone to cold alpine winds. There is little to no cell phone reception and no shops or amenities in the area so please prepare for extreme weather, hazards and emergencies. The new TrustPower Freedom Camping Area viewed from the road. There has obviously been quite a bit of money spent on leveling the ground, piling up the banks, installing water, and building the fence. View coming in through the gate and looking left. 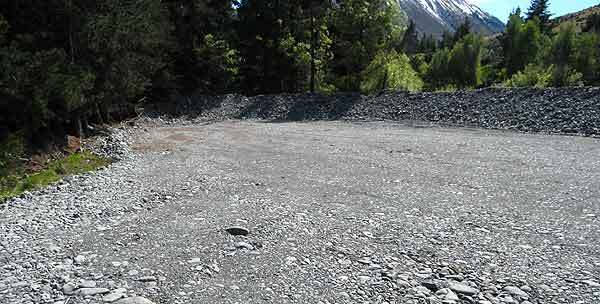 The camping area has been leveled and banked. View coming in through the gate and looking right. The camping area is big enough to accommodate everyone who might wish to camp there on Opening Weekend. The tap is in the right foreground. 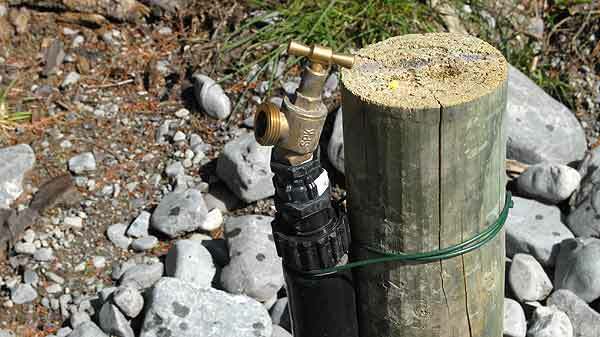 I turned the tap on for a moment and sure enough water was flowing! The new TrustPower Freedom Camping Area is shown in red and is located on the strip of land between the road and the Harper River Diversion at the head of Lake Coleridge. The main camping area in the past has been around the Boat Harbour next to the Oakden Canal. The new camp ground is about 1km from the lake shore though not really a problem as most anglers drive 4x4s. If you wish to stay for more than one night at the Trustpower Harper Freedom Camping Area email the following details: Your intended duration of stay, your vehicle registration, number of persons camping, and your cell phone number to: harpercamping@trustpower.co.nz Any queries phone 03 318 5700 from 8 am to 4.30 pm Monday to Friday. Previous « Kahawai Licence - Do I need a fishing licence to fish at river mouths?